Are you looking for a natural remedy for menstrual cramps? 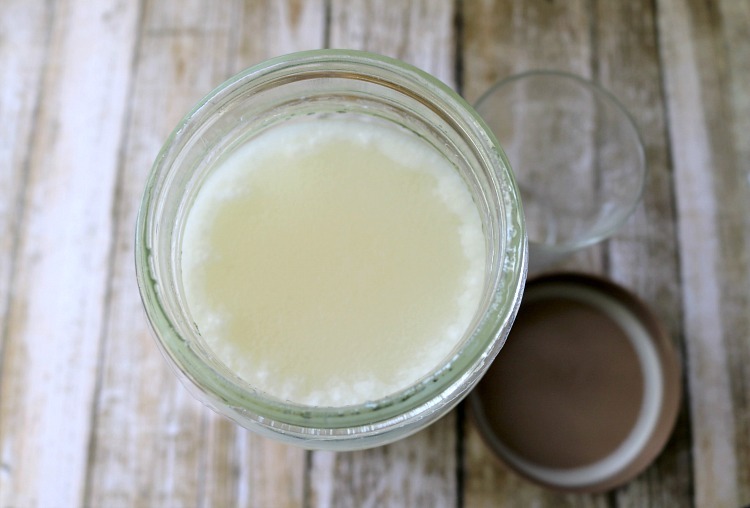 This DIY Women’s Monthly Menstrual Pain Relief Salve is all natural and it works great! If you are a woman who enjoys making your own homemade remedies, and you use essential oils, then this recipe for making a menstrual pain relief salve is a great one for you. If you prefer to purchase your natural remedies, here’s a pre-made menstrual relief balm that has great reviews. 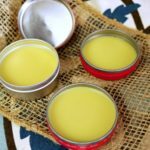 It may seem complicated to make a homemade balm or salve, as opposed to just using the oils for a remedy, but balms and salves are easier to make than they may seem. And the base ingredients are not only good for you as well, but they help hold the oils on and keep the benefits going longer than just using a straight oil. This recipe for a menstrual pain relief salve uses 6 different oils, and they are all added for their specific benefits to you during that time of the month. The fennel oil is added to help soothe your tummy and any nausea you may encounter from the cramps. The lemongrass oil helps with pain relief, so it works for cramps and muscle pain as well, and so does the marjoram oil. Then there is clary sage oil, which is wonderful for a general balance for women. It helps regulate your cycle and bring overall balance. Lavender oil is calming and works well to help relieve pain and swelling. Then lastly, peppermint oil is also a great pain relief oil. These all make for a great combination that will bring you much relief at your worst time each month. You can use your menstrual cramp relief balm daily to give overall balance to your system, which helps give relief when the time comes each month, or you can just when you really need it. 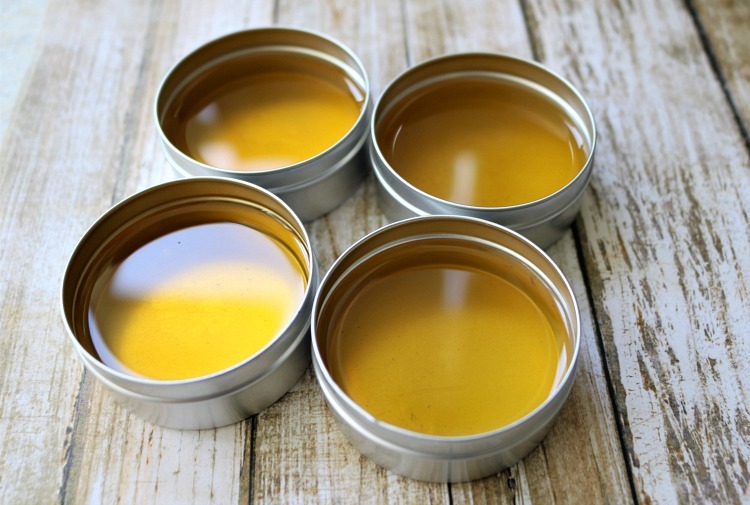 Tip for balm and salve making: Keep a knife and a spoon for balm and salve making only. That way they can get the wax on them and be designated for it. It won’t hurt your normal silverware, but it is nice not to have to worry about getting every speck of wax off when you’re all done. If you don’t have all of these essential oils on hand, you can also purchase the ClaryCalm blend and use that instead. I find that it’s one of the best natural remedies for cramps. Or you can purchase a pre-made menstrual cramp balm if you don’t have all of the supplies on hand. However, I think you’ll enjoy making your very own salve to relieve menstrual cramps. 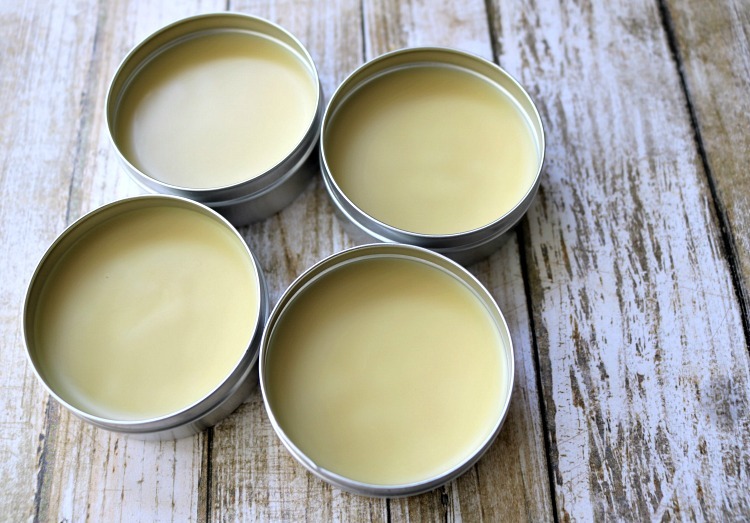 Start by removing the lids from your salve containers and lining them up so they’re ready to use. Using a double boiler, fill the bottom half of it about half full of water and place over medium to high heat, and place on the top half of the pan. Measure out your beeswax and add to the top half. At first, it won’t melt much, as the water is heating up, but as it gets hotter, you will hear it beginning to boil and the wax will start to soften and melt. 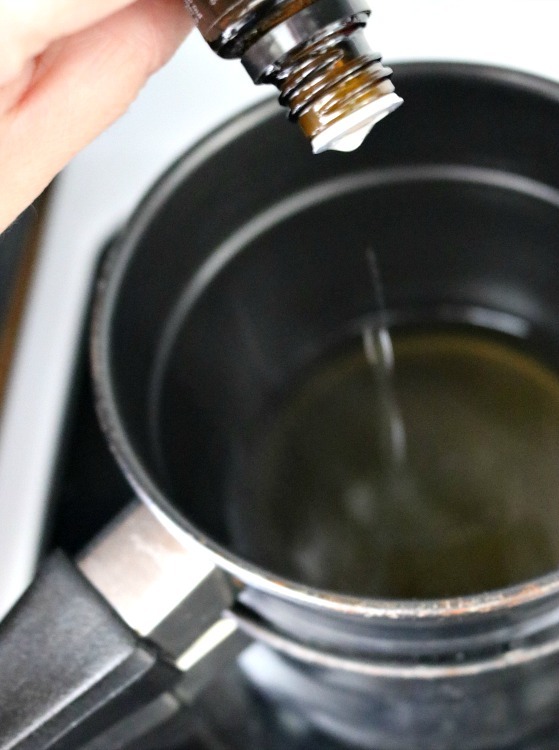 Turn the water down to low, so that it doesn’t heat too rapidly and burn the wax, and stir once or twice to help break down the wax in the process. While that is heating, measure your coconut oil and have it ready. 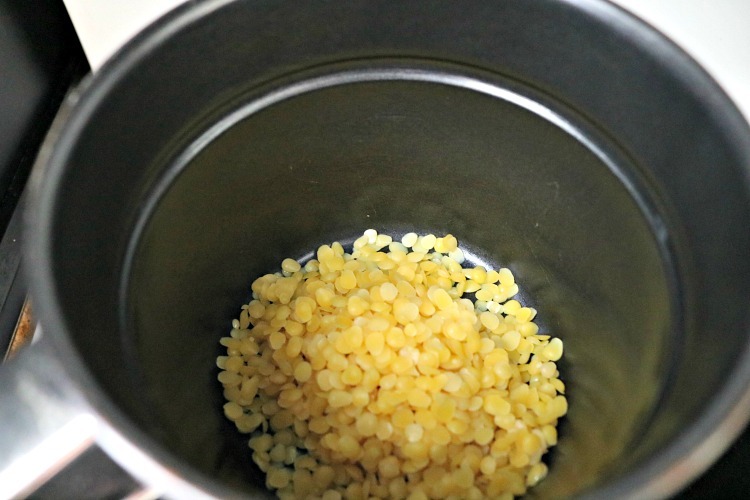 Once the beeswax is melted and clear, with no chunks of wax left in it, add in the coconut oil and stir. It will melt quickly and you can then add in the sweet almond oil. Stir in and let the mixture melt until clear. Remove from heat and allow it to cool slightly, but don’t allow it to start hardening. Now, add in your essential oils. A few of these are thin in consistency and the drops will start to come out fast if you tip them too far, so just take it slowly as you count them out. 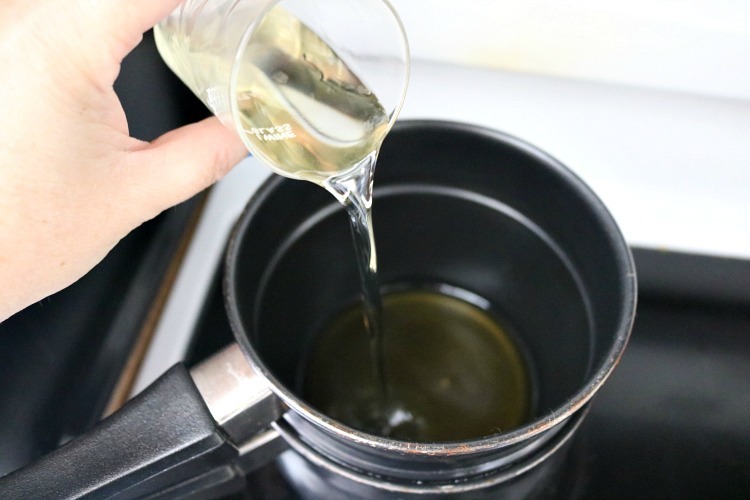 Once the oils are all added, give it a good stir to mix them in thoroughly and then you can pour the salve into the containers. Take it slow as your pour, much like you did with the oil drops and if it happens to begin to set up fast, you can put it back over the heat to loosen it back up, but likely it won’t unless you stop in the middle. 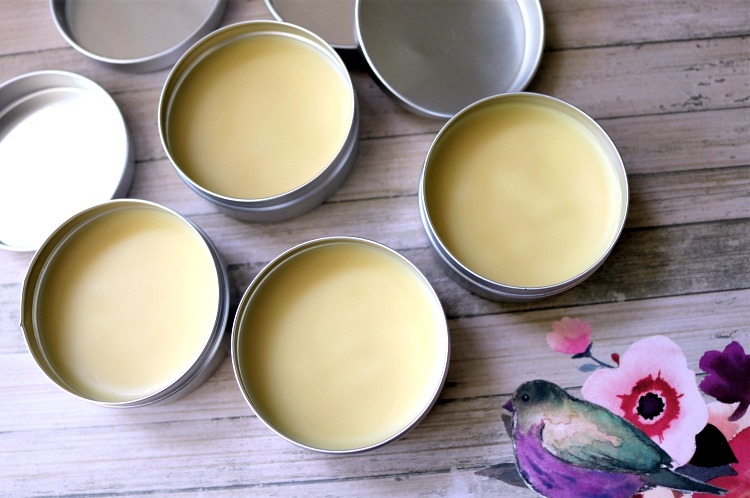 You will need to leave the lids off and let the balms sit out at room temperature until they are fully cooled off. It took close to an hour for mine, but it can vary depending on the type of container you use. Once the bottom of the container is no longer warm, it is good to go and you can put on your lids. Add a cute label if you’d like, and they are all set to use. To apply, dip a fingertip into the salve, getting about a pea-sized amount and rub into area of pain or discomfort. I use it on lower abdomen and lower back, but it can be used anywhere you are achy. There are many natural remedies for menstrual pain relief. This salve is excellent! I also love taking maca root powder. If you prefer your home remedies pre-made, you can purchase a menstrual pain relief balm here. What other oils do you like for menstrual pain relief? Remember to Pin this post to your natural remedies or women’s health board! It is always nice to learn about new ways to use natural substances for health. Thank you! Thanks for joining the To Grandma’s House We Go link party! Hope to see you next week. Thanks for sharing this with SYC. I love this idea! I already use lavender oil and dried lavender all over our place. Thanks for sharing! Chrystal, I love this cramp salve idea! I had no idea that there was such a thing as a soothing salve for menstrual cramps and pain – that’s so great! I don’t have all the oil yet, but I guess lavender and peppermint is a good place to start. I have featured you at the Friday Favorites linky party this week. Come check it out! https://be-alice.blogspot.com/2018/02/friday-favorites-week-410.htmll Hope you pop by and visit again this week ? Can I use black see oil instead of the fennel? I would love to make this a for my sisters, we have a family gathering coming up soon & it would go great in my gift bag. I haven’t worked with black seed oil. Is that an essential oil? If it’s an essential oil you may be able to swap. Or you can just leave out the fennel. Thanks for the recipe. Has anyone else found that it is very hard once set and hard to apply? Is it meant to be this solid or is it meant to be soft? I made it last weekend but having trouble applying it. If it’s too hard, you can melt it back down and add more oil. Some people like firm balms because they hold up better in warm weather. 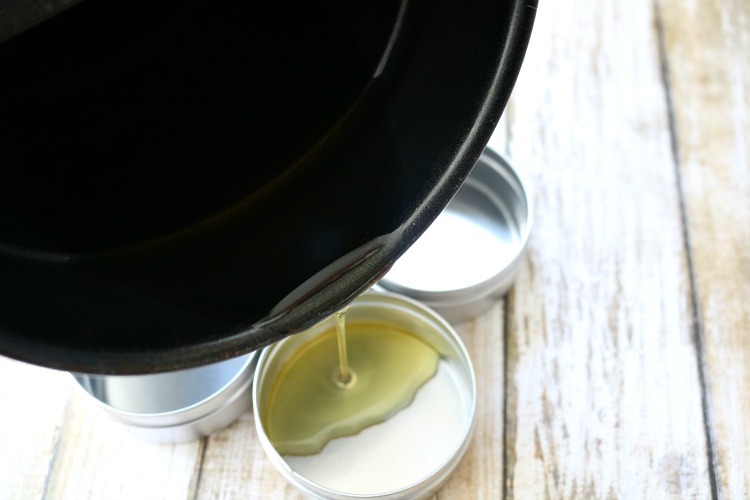 Others prefer their salves and balms softer, in which case you would use less wax. Hi Crystal, if you use the Clary Calm blend, how much would you add here? Also, it comes in a roller, what is the best way to measure and work with it? You can buy pipettes to transfer drops from the roller bottle. Then just equal the number of drops of Clary Calm to the number of drops in this recipe. Make sense?